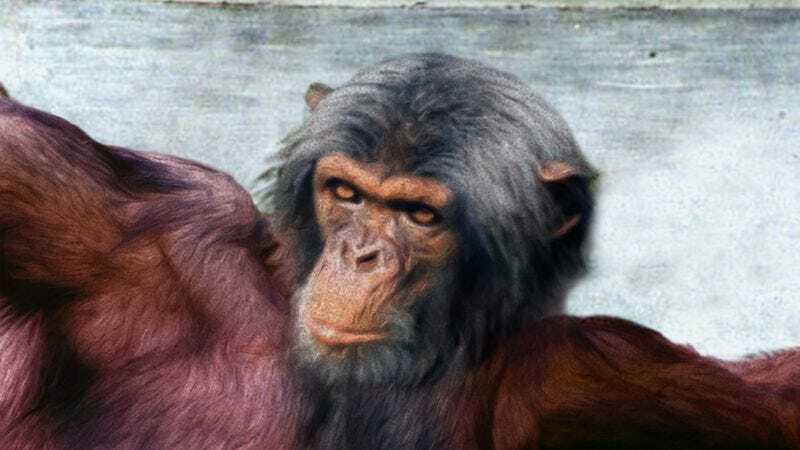 Researchers say today’s Lord Almighty shares many traits in common with the chimp deity, including color vision and omniscience. BERKELEY, CA—Challenging long-held views on the origins of divinity, biologists at the University of California, Berkeley, presented findings Thursday that confirm God, the Almighty Creator of the Universe, evolved from an ancient chimpanzee deity. According to experts, divine life began as a single-celled all-powerful organism roughly 3.6 billion years ago, eventually evolving into a multicelled, sponge-like deity that bobbed and floated across the chaos of the early universe. Kamen explained that over hundreds of millions of years, the godlike life form became more complex, with limbs that allowed for locomotion across the endless expanse of the heavens, and sophisticated photoreceptor cells capable of seeing all things. Based on newly obtained evidence, the Pan sanctorum is thought to have first experimented with creation ex nihilo around 7 million years ago. Kamen noted that the chimpanzee deity made several early attempts to produce rudimentary solar systems, but on each occasion was spooked upon inadvertently creating fire, which is said to have caused it to screech loudly, angrily swat away the newly formed sun, and then scamper across the universe to hide from the flaming sphere. Though its smaller brain limited its cognitive abilities, the chimpanzee deity is believed to have possessed not only self-awareness, but also spatial intelligence, object permanence, and a rudimentary capacity for knowing all that is, all that has been, and all that ever will be.